I don’t know what it is with crayons, but sometimes I find those little broken bits in the strangest places. There are broken crayons at the bottom of the toy box, in my handbag, in the car, and a few stragglers left remaining my kids actual pencil cases. I used to be pretty quick to throw them out, but the other day doing a clean out of my kids craft supplies, I realised exactly how many of them we had and decided to repurpose them instead – Into some Easter crayon shapes they can gift to their friends! This tutorial will show you how to melt crayons in the oven to create your own personalised crayons for easting. This is a super fun and cute Easter gift idea using silicone chocolate moulds and crayons. It makes a great class gift idea for your children’s school friends or as an Easter party favour for kids. I’ve put together a Easter crayon shapes tutorial for you, plus have some printable Easter cards to colour! 2. Gather up your broken or full crayons and peel the papers off them. 3. Break your crayons into small pieces. You may wish to use a knife and a chopping board to do this, as some are harder to break than others. 4. Fill your silicone moulds with crayon pieces. 5. 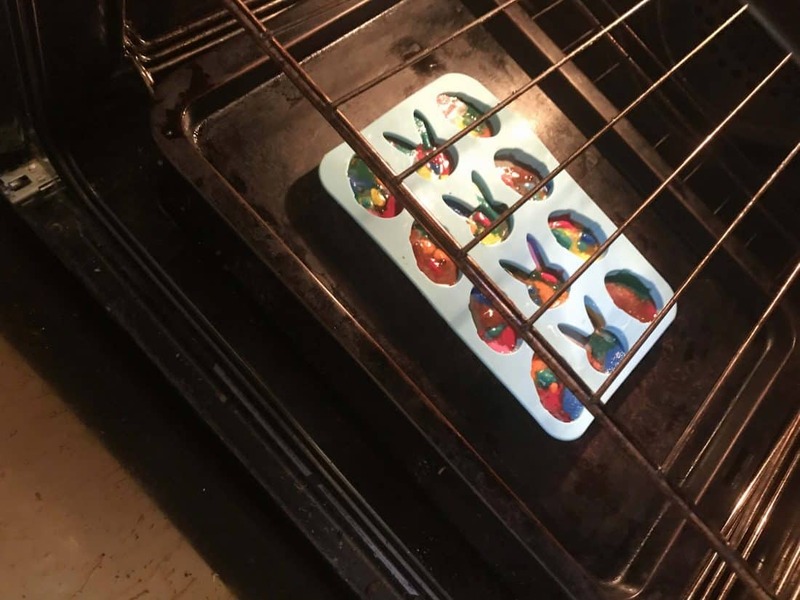 Place moulds in the oven on a baking tray for around 10 minutes. This will make it easier to remove once melted. Keep a close eye on them. If you leave them too long, the colours will mix together too much and you will not get the same rainbow effect of your different coloured crayons. 6. Once melted, remove baking tray with moulds from oven and leave to cool for at least half an hour to allow them to set. 7. 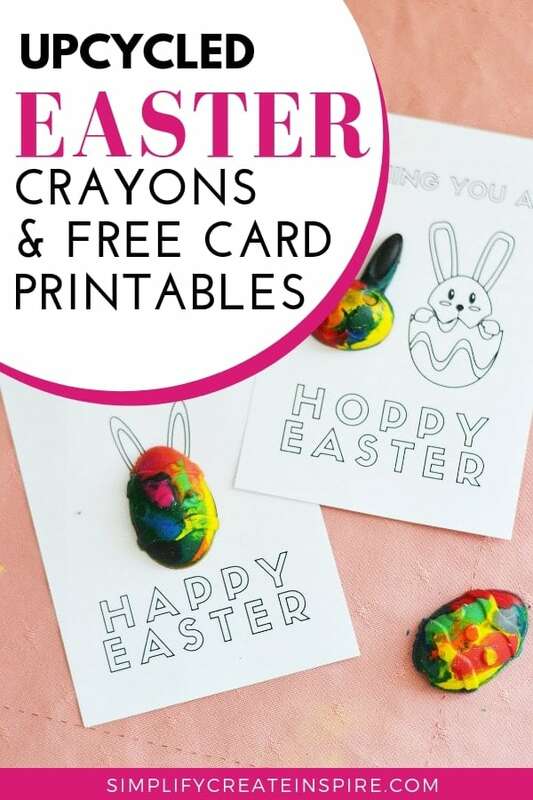 Attach to one of my free Easter card printables using double sided tape or a sticky dot and they are ready for gifting! This is a great upcycling project you can do with your kids, however melting crayons in oven will require some parental assistance for safety reasons. Your kids will love creating their own colour combinations before melting crayons into molds, making it a chance for them to personalise as they please with the different coloured crayon pieces. The Easter card printables can also be given out on their own at Easter time, without the crayon shapes. You could pair them up with a little set of pencils or felt pens, so they can colour their own Easter cards. To make the cards, download the printable Easter card templates below and print on 4×6 paper. I use matte photo paper for convenience and print them at the actual size, using the photo printing section on my printer. You could use a word document and print multiple cards to a single page if you do not have a 4×6 printing option with your home printer. Or print via a photo lab instead, choosing matte paper so that the cards are able to be coloured in easily with crayons or pencils. Glossy photo paper is not an easy texture for colouring. 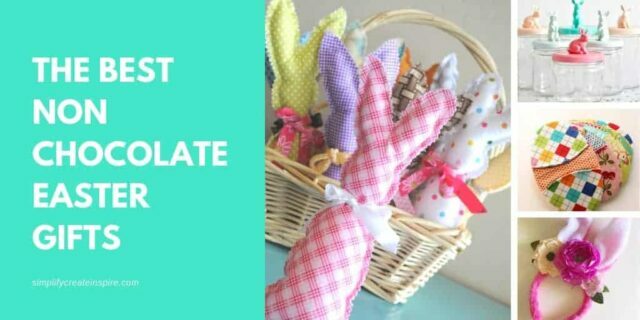 I hope you love these easy to make Easter gift ideas for children. You can use silicone moulds of any shape to make similar gifts for any occasion during the year, such as Christmas shapes, Valentine’s day hearts, or simple crayon shapes. This is a great way to upcycle some of the crayon pieces you may otherwise throw out! This time of year is great to give younger children plenty of learning opportunities through Easter STEM activities and craft activities that will encourage creativity and development.